Upon clicking the link, the recipient will see a dialog box similar to the following (Note: If for any reason clicking the URL link does not bring up the dialog box, the recipient can copy the URL and paste it into their Broswer). Once the dialog box appears, all they need to do is enter their name and click the green Complete button. This will close the dialog box and update the Broker Brain task. 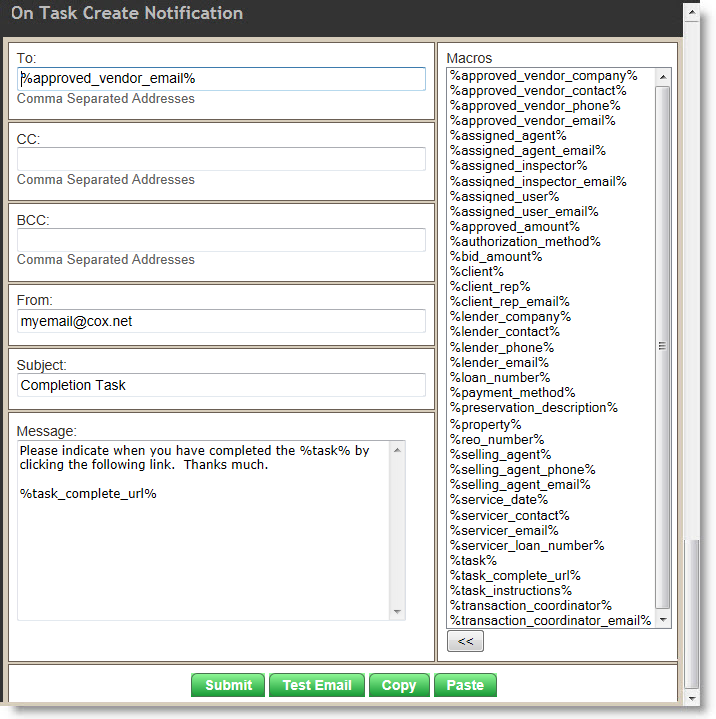 To begin, create a Task & Email Notification following the Creating Email Notifications instructions for Offer, Preservation, or Property Auto Tasks. The Email Notification type used should be On Create Notification. Use an email Macro in the To: field if possible. In our sample below, we used the %approved_vendor_email% macro (note that our sample is a preservation Auto Task). In the body of the email, add the %Task_Complete_URL% macro, along with some verbiage to explain to the user what the link is for. You may also want to add the %Task% macro so the recipient will know which task you are referencing. Be sure to click the green Submit button when you are done creating the email notification. It is critical that before you exit the task, you have checked the Enable box shown below, AND clicked the green Update button at the bottom of the task box. Failure to do one or both of these things will prevent the Email Notification from being sent.